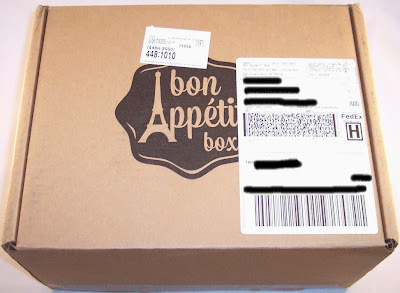 The most decadent food subscription I've run across is Bon Appetit Box. They have a monthly service and you can also buy individual boxes curated around various themes. At $75 per box, this is definitely one of the most expensive food subscriptions around. That's why I pounced when Gilt City ran a promotion in April where a single box could be purchased for $52 or a two month subscription for $97. Not surprisingly, this deal sold out very quickly but there is a waitlist in case you're interested in lining up for the next (hopefully) Bon Appetit Box promotion. Because of the financial commitment (which included a $13 shipping fee) and my lack of familiarity with this company, I decided to try the single box deal. The nice thing about these is that you can see a list of every included item on their site. Unlike a subscription, there are no surprises. 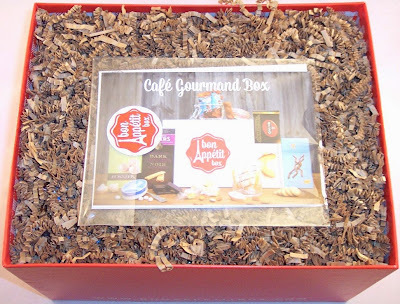 After a careful study of the five available single boxes and their contents, I settled on the Cafe Gourmand Box which is full of French sweets and treats. All of the items are comprised of miniature sweets with the idea being that you can enjoy several of them guilt-free after a meal. 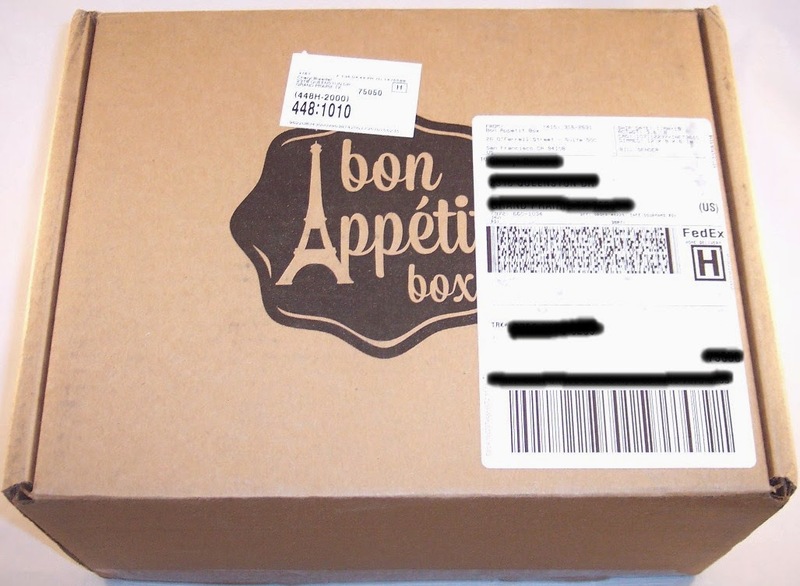 I don't know how they did it, but my Bon Appetit Box arrived just four days after ordering! It was shipped by FedEx Ground and arrived in a satisfyingly large branded box. 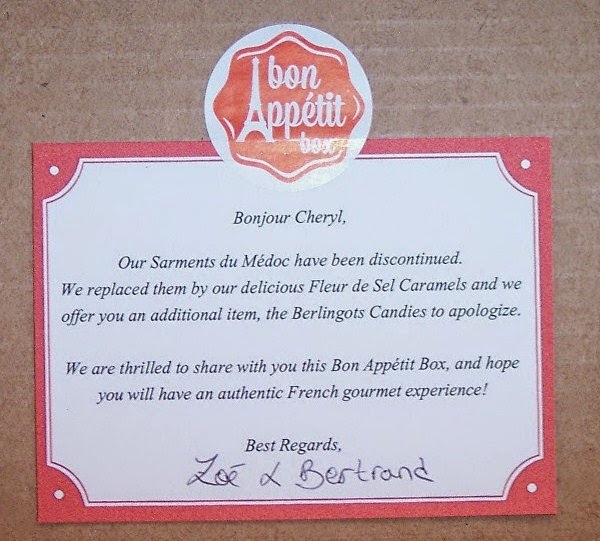 Inside the lid of the cardboard box was a personal note from Zoe & Bertrand (the French epicurians who founded Bon Appetit Box) letting me know that the "Sarments du Medoc" have been discontinued. They have been replaced in this box by two other items which I'll note below. I was fine with this since the discontinued item was the least interesting to me and I am quite happy with the substitutions. A beautiful 6" deep gift box with a quintessentially French red and white plaid interior was inside the outer box. This is a really nice sturdy box that can be used for storage later. So far, so good! A sea of brown crinkle shreds topped with a package containing a set of elegant information cards greeted me. There are seven custom printed cards. 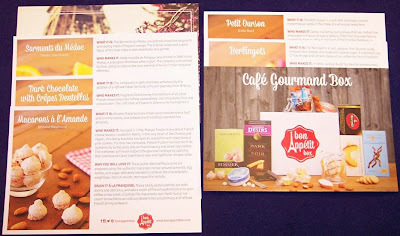 One introduces the Cafe Gourmand Box and lists all the items in the box. Five cards picture the items (one on the front and one on the back) and give plenty of information about each one ("What it is", "Who makes it", "Why you will love it" and an "Extra Morsel" of information). The seventh card is a postcard featuring the Eiffel Tower on one side. First out is a 3.5 oz. 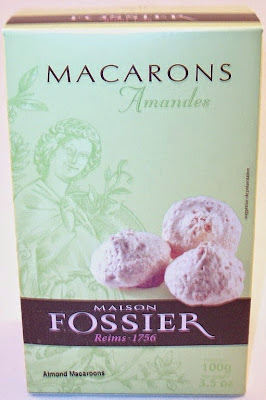 box of Almond Macaroons from Maison Fossier. The card mentions that they are the oldest French cookie factory, founded in 1756. These delicate little cookies are light and crunchy and made with finely ground almonds. This very over exposed photo is of a really cute little tin of Berlingots from Kubli. 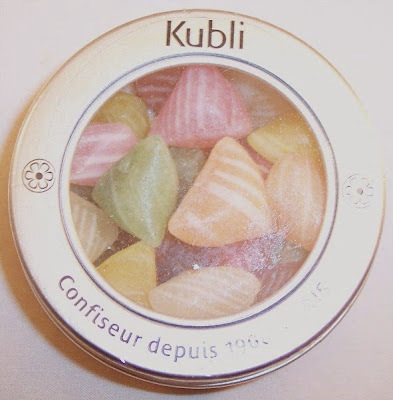 The lid of the tin has a window so you can see the colorful little candies inside. These are fruit flavored and made from a sugar syrup. 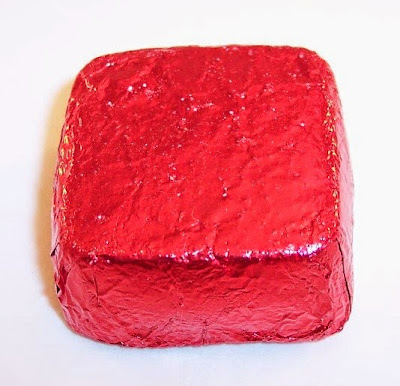 "Berlingot" translates as "humbug" which, besides its more common definition, is also a term for little double pyramid shaped striped candies. This was an additional item added to the box to make up for the missing Sarments du Medoc. This package contains ten individually wrapped Petit Oursons (little bears). These are soft milk chocolate covered marshmallows in the shape of teddy bears. This candy was introduced in 1962 and took the form of a teddy bear because of its cherished image to French children. The replacement item for the discontinued chocolates is this cute little square containing nine Fleur de Sel Caramels. These come from Bretagne. They have a delicate flavor and a fudge-like texture. This is a box of Vanilla Flavored Wafers from Bouvard, a crispy cookie made with vanilla and butter. This light biscuit is a French staple, also historically referred to as "cat's tongue" (langue de chat) due to its shape. These are often doused in tea or coffee and served with dessert. I would have no respect for a gourmet French box that did not include chocolate! This decadent looking dark chocolate bar from Flagrants Desirs ("Bite in case of craving") is called a Crispy Crepe Dentelle. This is a 72% cacao chocolate with bits of buttery crisp crepe to offset the bitterness of the rich black chocolate. Delectable bliss indeed! 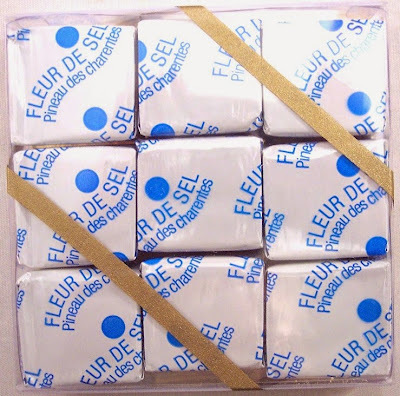 Thanks to subscription boxes (French Box, in particular), I have come to love calissons, which are a specialty of Provence. This is a soft candy, somewhat like marzipan, made of sweet almond, orange peel and candied melon. These are made into a paste which sits on a wafer bed and is coated with royal icing. French confectioners can be counted on to come up with the most adorable little candy tins. 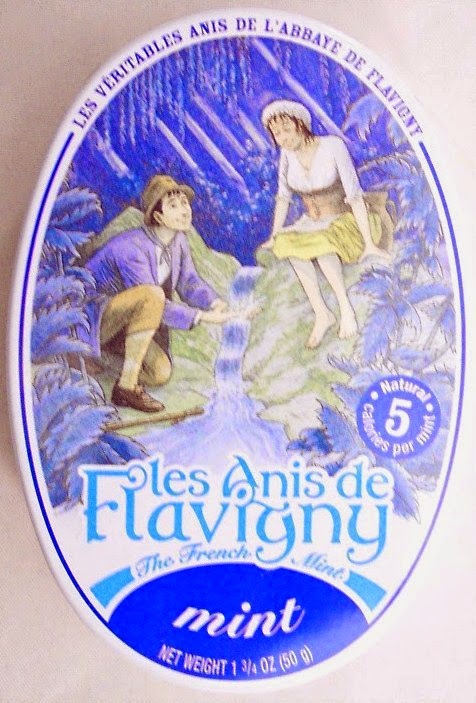 Such is the case with this charming little tin containing Les Anis de Flavigny. A mint flavored sugar syrup is poured over an anise seed to create a long-lasting hard candy. I'm skeptical as to whether I'll enjoy these or not but there's no doubt about the tin....with the beautiful artwork on the lid, it's a keeper! Last but certainly not least is this big package of Nougat de Montelimar from Chabert & Guillot. Montelimar is a small village in southwest France that is considered the world's nougat capital. These soft nougat bites are made with honey and almonds. 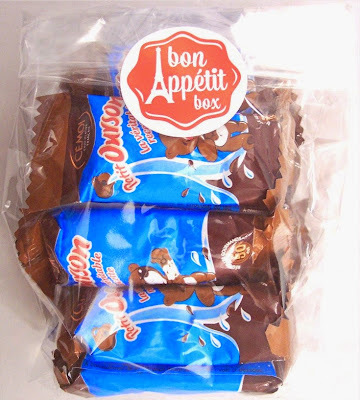 They are much more delicate in flavor and texture than the overly chewy and processed forms of nougat we have in the U.S.
What an absolutely luxurious delight it was to dig through this box! The elegant presentation and impeccable curation put this ahead of pretty much any other food box that I've tried. While $75 (+ $13 for shipping) is quite steep for a monthly box, the option to purchase a single box is much more palatable, especially if you can locate a discount deal. Besides the Cafe Gourmand box that I ordered, there are four other single purchase boxes. Click on any of the links to see exactly what to expect. 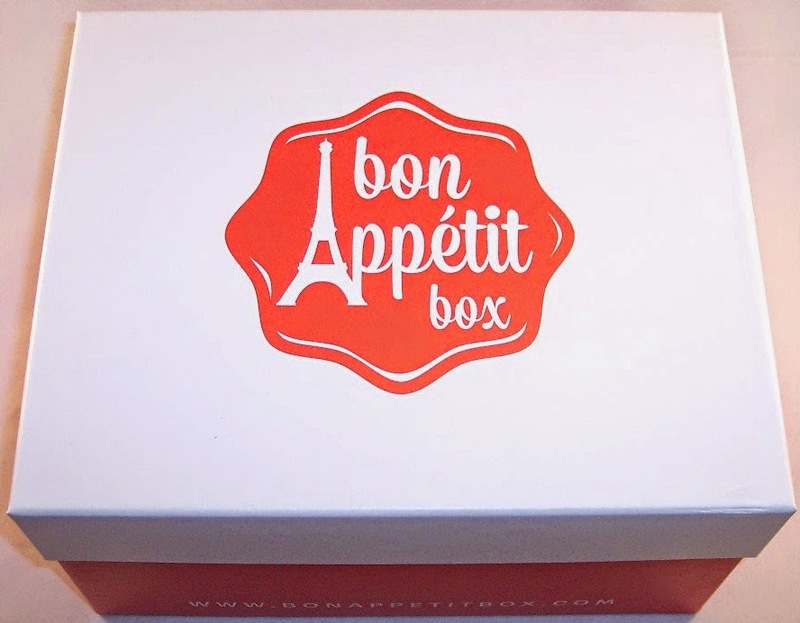 Amour Box - contains 8 full size items that will add a romantic touch to a special dinner night. 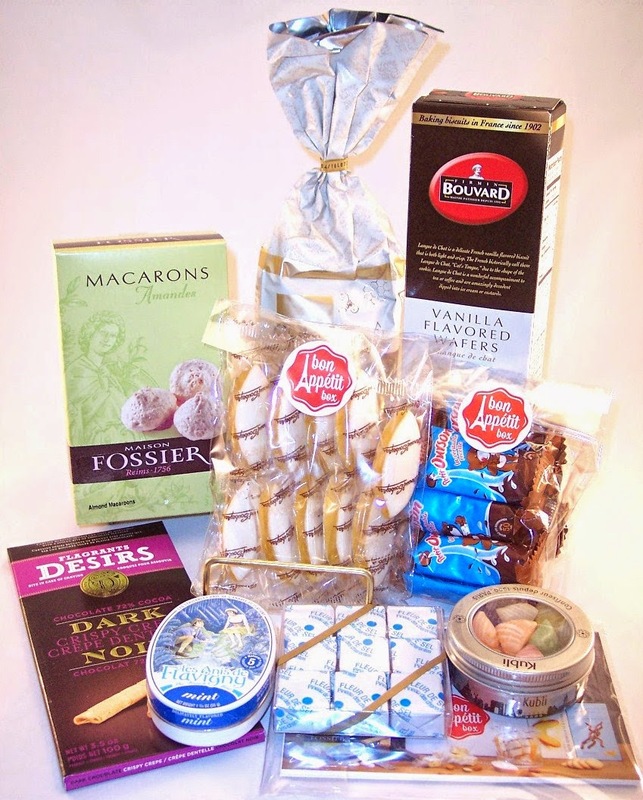 Paris Aperitif Box - relax, unwind and experience Paris with some delectable artisan goodies. Provence Aperitif Box - experience an authentic taste of Provence, pure French Mediterranean bliss! Bon Appetit is firmly planted on my radar now. I'll be watching for future deal site opportunities, so keep an eye on my Facebook page for any updates. For $75, you expect a great box and I have to say that Bon Appetit delivers! P.S. It's probably obvious but any of these boxes would make the ultimate personal or business gift. Who wouldn't want to receive one of these? 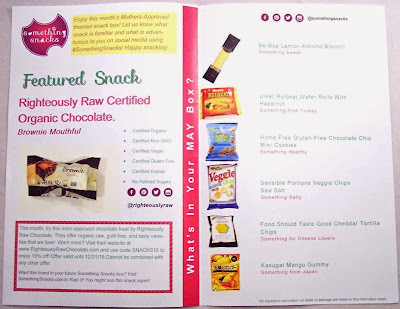 Something Snacks Review, May 2015 + $3 Discount Code! One of the least expensive snack subscriptions is Something Snacks. 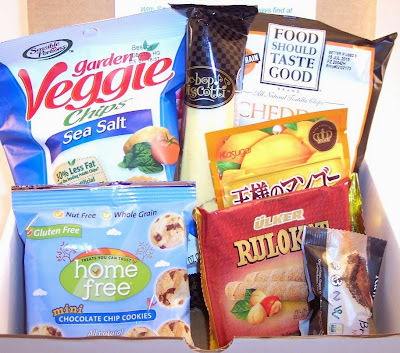 They send a variety of hand-selected products, including at least one sweet, one salty, one international and one healthy snack. Boxes are $10 per month or $9 if you commit to six months or a year. (There is a $3 per box shipping charge for the U.S. and $8 for Canada.) Recurring orders are billed on the first of each month and boxes are shipped between the 7th and 15th of the month. The theme for Something Snacks May box is "Mothers-Approved". Everything arrived in a medium sized white box with a logo sticker on it. As always, there were seven full size single snacks. 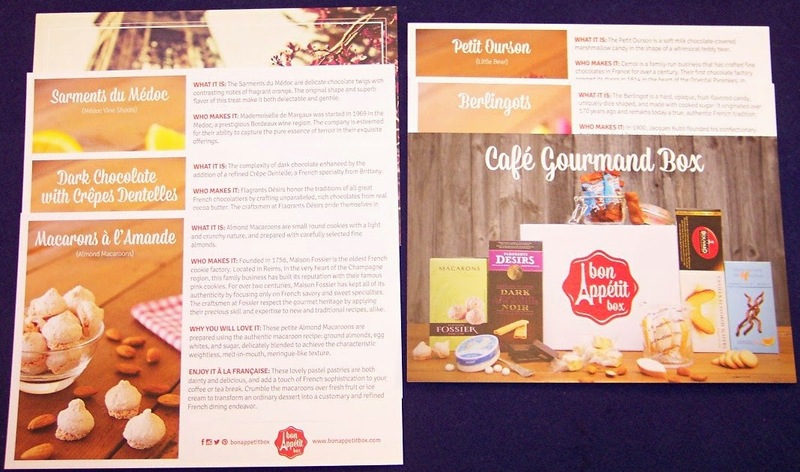 The information brochure gives the theme for the month and shows a color photo of each snack. It also introduces the featured snack for the month. 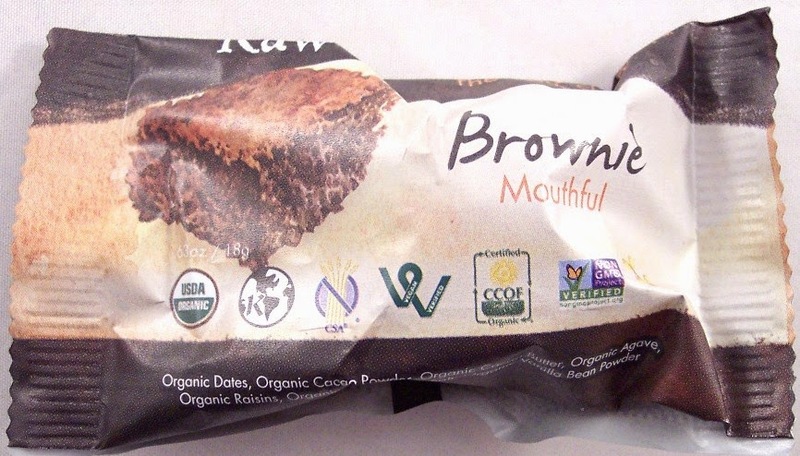 The featured snack is a "Brownie Mouthful" from Righteously Raw. I must admit the name of the vendor is a turn-off to me....who really wants a raw brownie? The name and picture on the wrapper are very misleading. This is in no way, shape or form a brownie. It's a smooth molded candy that looks like a truffle and tastes like a very high percentage cacao content chocolate. As much as I like dark chocolate, this was too bitter. When I read the label, I saw why. It contains dates, agave, raisins, cacao, vanilla bean powder and a few other things....no refined sugar. Just not my thing. 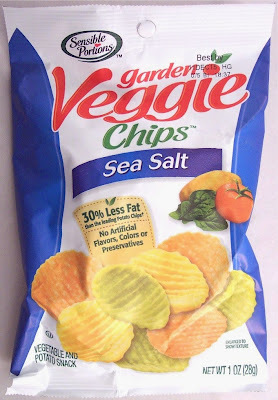 Much more to my liking are these Garden Veggie Chips from Sensible Portions. I've had these before and really like them. They're a little better for you than regular potato chips but not so much that the taste is affected. 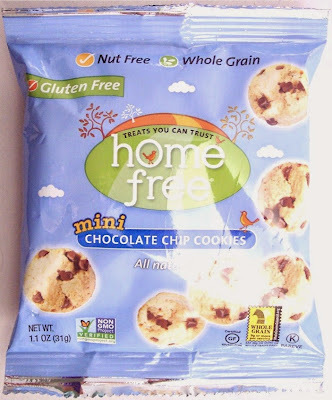 Another snack I've had before are these Mini Chocolate Chip Cookies from Home Free. I usually don't like packaged cookies but these are pretty tasty...as long as you don't have the competition of any fresh homemade chocolate chip cookies lying around (always a hazard at my house). 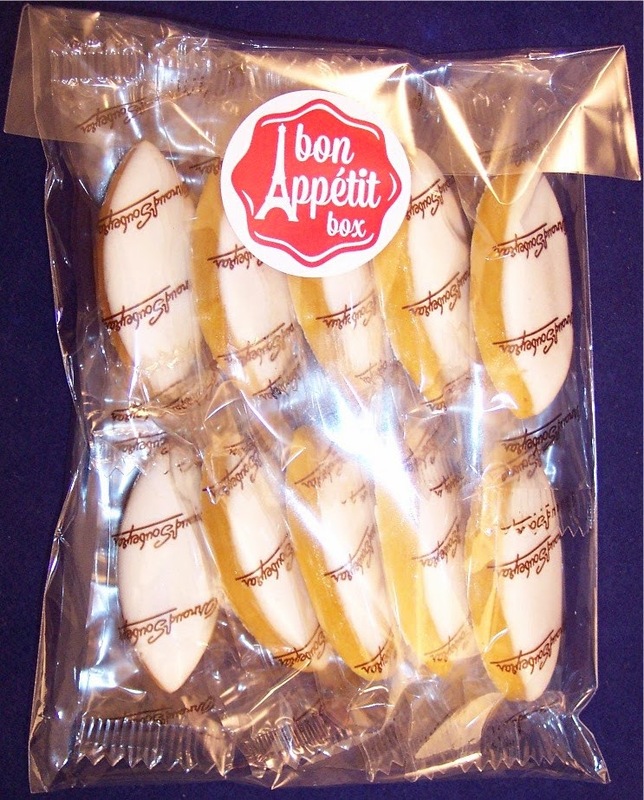 This is a big Lemon Almond Biscotti stick from Be-Bop Biscotti. (The photo doesn't do justice to the size.) One of these in chocolate mint flavor showed up in Something Snacks' March box. It was delicious! 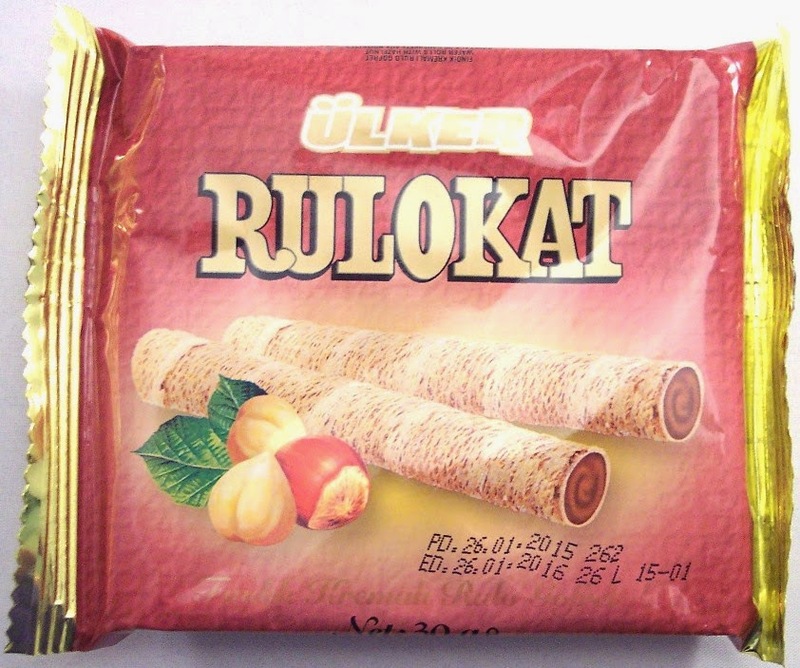 This package contains rolled wafers filled with hazelnut cream from Ulker Rulokat. 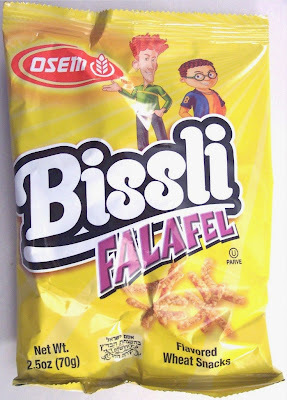 This comes from Turkey, a country I've learned to respect when it comes to snacks. 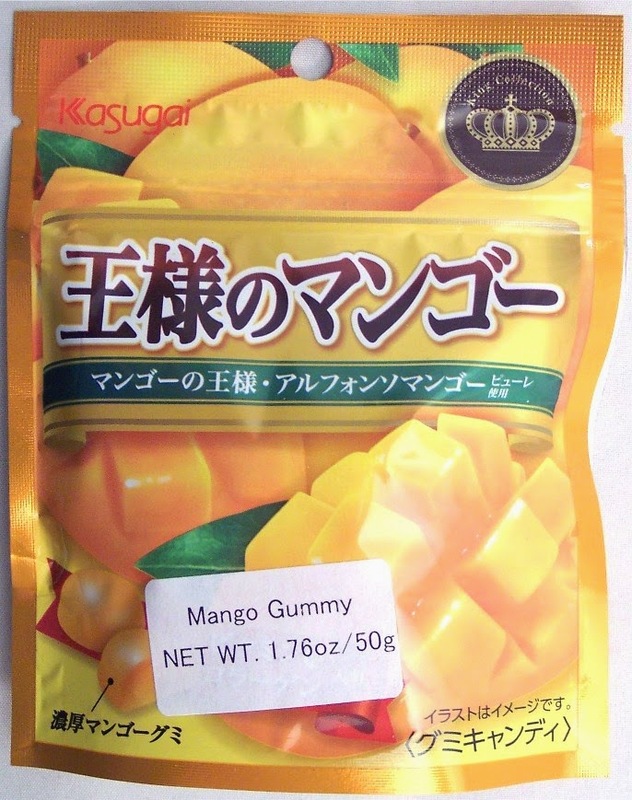 These Kasugai Mango Gummies come from Japan, another country that gets their snacks right. 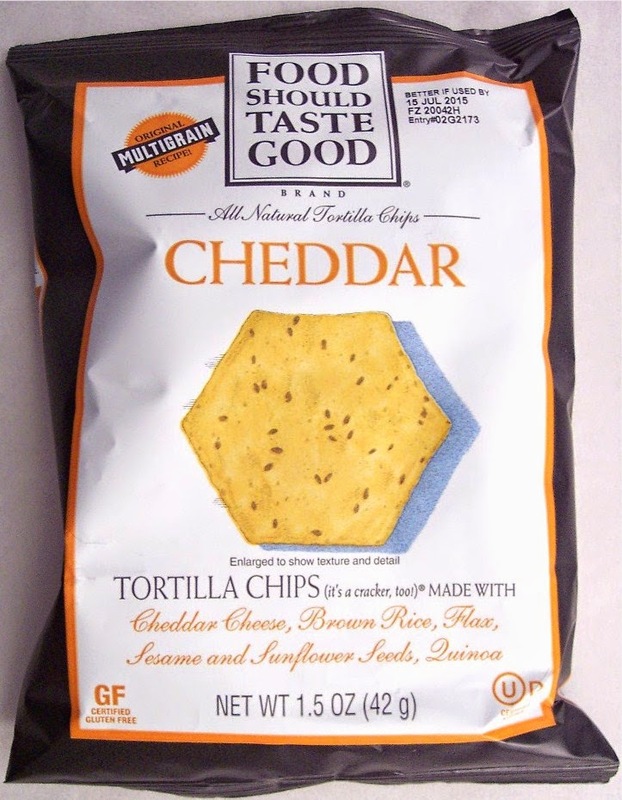 The final item is a package of Cheddar Tortilla Chips from Food Should Taste Good. These all natural tortilla chips are made with cheddar cheese, brown rice, flax, sesame and sunflower seeds and quinoa. Despite all the virtuous sounding labels on this package, these are quite high in fat. That probably means they are good! There you have Something Snacks for May. I'm pretty happy with this box; the only item I would not repeat is the Brownie Mouthful. Otherwise, these all look tasty and should calm the snack monster for a while. Although you can't choose what comes in your Something Snacks box, there is an opportunity to rate the featured snacks on their site. I have liked most of them but they'll definitely hear from me about the imposter brownie this month. The Something Snacks box for June will have a Father's Day theme. If you're interested in checking them out, use code TRY3NOW for $3 off any subscription. 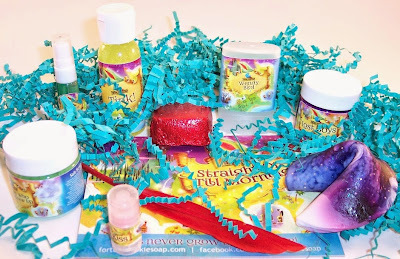 Fortune Cookie Soap Box Review Summer 2015 + $5 Store Discount! Nobody employs wit and creativity in their products the way the Fortune Cookie Soap Company does! They walk to the beat of a different drummer, entertaining us all royally in the process. 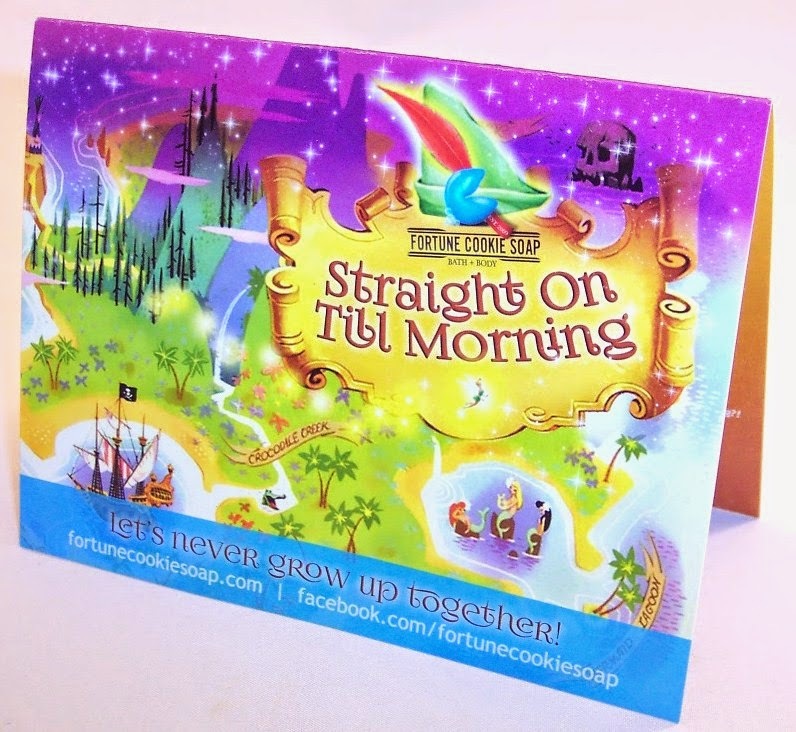 For their Summer 2015 Soap Box, the theme is "Straight on Till Morning". All the products are named with some reference to Peter Pan, although you'll never see that name directly referenced. How they avoid legal ramifications is a mystery to me. 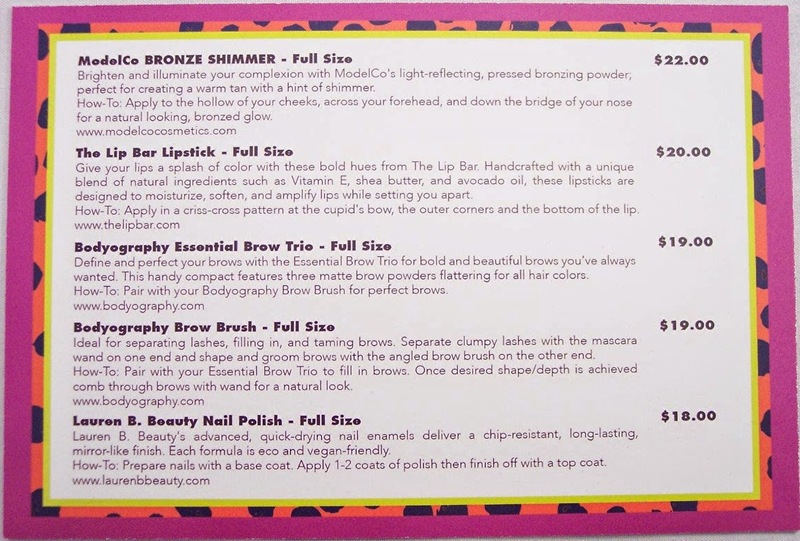 The information card introduces the theme and gives a color photo of each item inside. The product descriptions are sometimes irreverent, humorous and occasionally downright risque. Every quarterly box contains one of their signature fortune cookie shaped soaps. 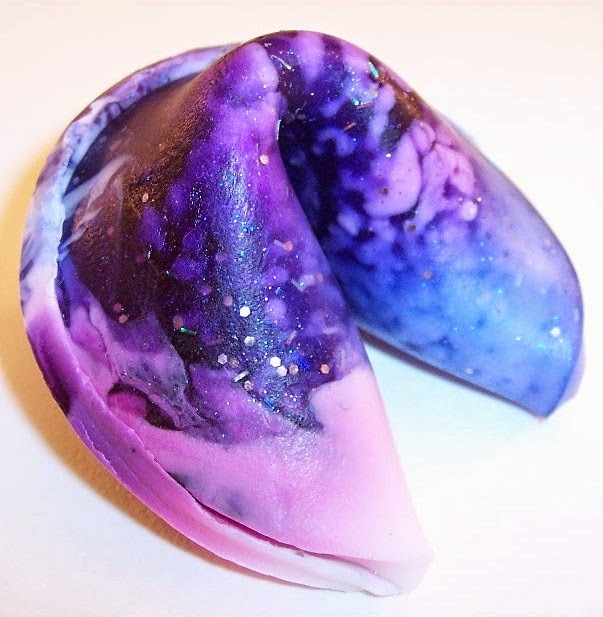 This one is called "Second Star to the Right" with a midnight sky melange of glittery blue, pink and purple. The scent is described as "crushed berries and mint leaves with a splash of sparkling pomelo, served over iced sugarcane". These soaps degrade quickly in water but they smell great and contain fun fortune slips. 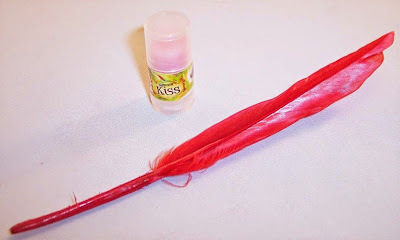 A charming touch was the inclusion of this red feather; as if Tinkerbell had graced it at some point! There is also the tiniest "Kiss" lip balm I have ever seen; there is literally about a third of an inch of product here. 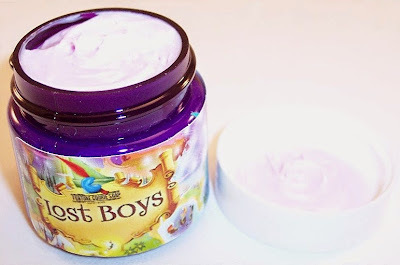 This does have a nice light and fruity scent, comprised of watermelon, pineapple, coconut water and fresh citrus juices. Since a tube retails for just $3.49, it does seem like they could have included a full-sized one. This little pot of salt scrub is called "The Boy Who Never Grew Up". 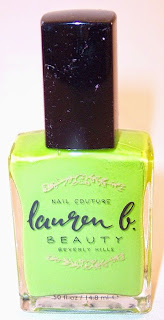 This is a pretty shade of green and it has a very subtle margarita scent. Every FCS box I've received has contained a little bottle of hand sanitizer so they are stacking up around here. 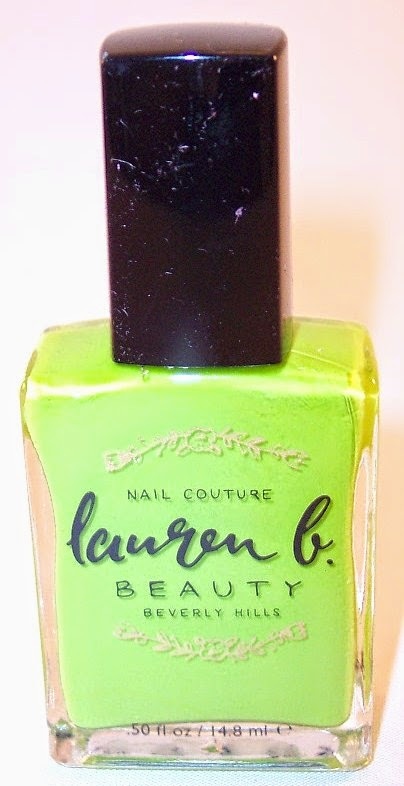 This one is named after Tink herself and is a light chartreuse color filled with subtle sparkle. The scent is described as "fresh cherries in cream sprinkled with toasted coconut and a fairy dusting of powdered sugar". I would have never guessed those elements; mine has a pretty strong top note of alcohol. This tiny little veggie protein deodorant is a new addition to the box; I don't think they've ever included one before. 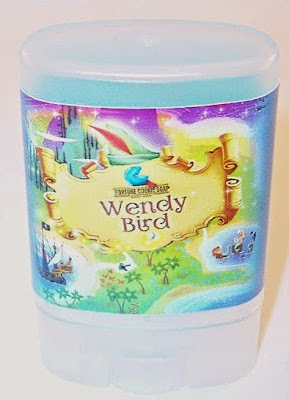 This is called "Wendy Bird" and has a semi-transparent icy blue consistency. 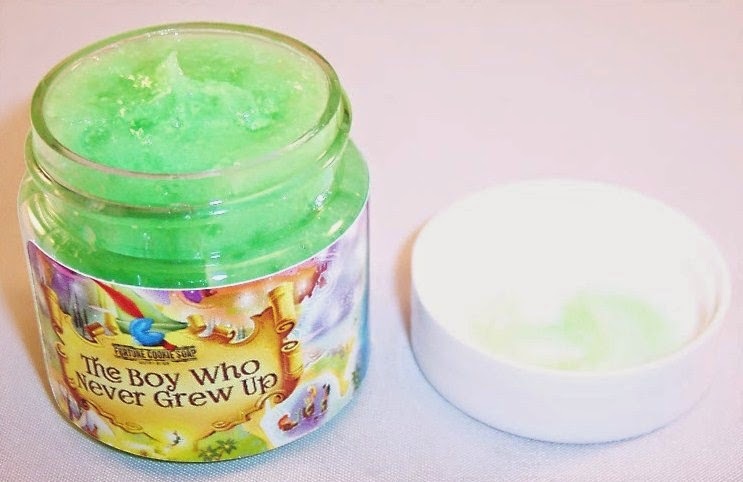 The scent is green apple with a tropical twist; if it works, this is a keeper! This pump spray sample contains a two phase perfume oil called "Mermaid Lagoon". This has an odd appearance, like a gelatinous cocoon suspended in liquid. The scent is hard to describe and the description on the card does not help. I'd say there is some coconut in it, a mix of fruits and a hint of vanilla. I believe most of the FCS boxes have contained a foil wrapped shower steamer, called "Steam Me Up Scotty!" This one is also called "The Captain" and smells of magnolias and berries drenched in fresh cream. These don't last long but they add a nice bit of scented luxury to the shower. My favorite product in this box is this cute little pot of "Lost Boys Whipped Cream" which is a lovely pale lavender color and smells of apricot and peaches. This is one I might actually buy in the full size. I believe the Summer Soap box is sold out but now is the time to sign up if you're interested in the Fall box. The one last year arrived in mid-August. These boxes are extremely popular so I encourage you to get on their mailing list if you're interested in reserving a spot or hearing about the various collections they promote between now and then. Of course, the point of the quarterly box is to get you to check out Fortune Cookie Soap's store. They have had availability problems in the past (especially with items promoted in the current box) but I see plenty of products from the "Straight on Till Morning" collection right now. So maybe they have that issue under control. The store is a lot of fun to browse and you can also pick up products from past boxes. Click here for a $5 discount off a $30 purchase in the store. If I were in the very sad position of having to choose just one beauty sub box, Boxycharm would be a strong contender. This post is going to sound like a paid advertisement but trust me, it's not. Boxycharm deserves all the praise I can pile on; nobody sends more beauty product value and quality for the price paid! For a measly $21 per month, you get 4 to 5 full sized beauty products that reflect current and emerging trends from hot brands. If you go all in and sign up for a year at $231, you get one month for free, making your effective monthly cost $19.25. May's Boxycharm box contains five full size products, two for brows and one each for lips, nails and cheeks. The information card is clear and concise. Since full size items are in the box, the prices shown are relevant. 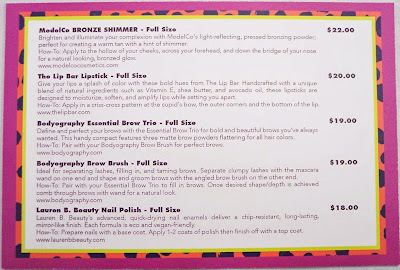 That's not always the case with beauty boxes that send samples, then misleadingly put the full size retail prices on their information cards. At a glance, you can see that the combined retail value of the May box is $98...already impressive! The first item is a lipstick from The Lip Bar, a brand I'm not familiar with. 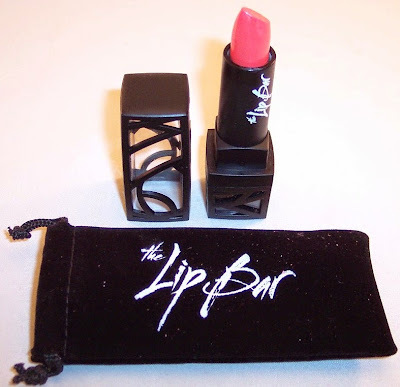 It came in a black velvet drawstring bag and has the most innovative packaging for a lip product that I've ever seen. The shade I received is "Kiss Me", which is a bright coral pink. 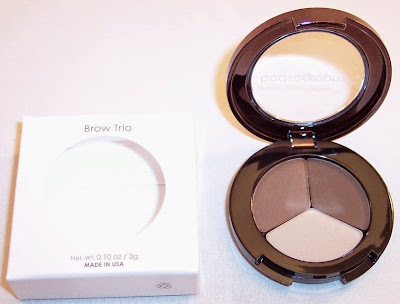 Next is the Essential Brow Trio from Bodyography. This compact contains three matte brow powders that should be flattering for all hair colors. Since brow shaping and coloring has been a major beauty focus for a while now, this product is right on trend. Another product from Bodyography (isn't that a great name for a cosmetic company?) is a double ended brow brush. One end has a mascara wand and the other end has an angled brow brush. The information card is a little confusing, saying that the mascara end is to separate clumpy lashes. I have a little comb that does a much better job of that; seems like this would be more useful for brow maintenance. This tool pairs well with the Essential Brow Trio above. The "Wow!" 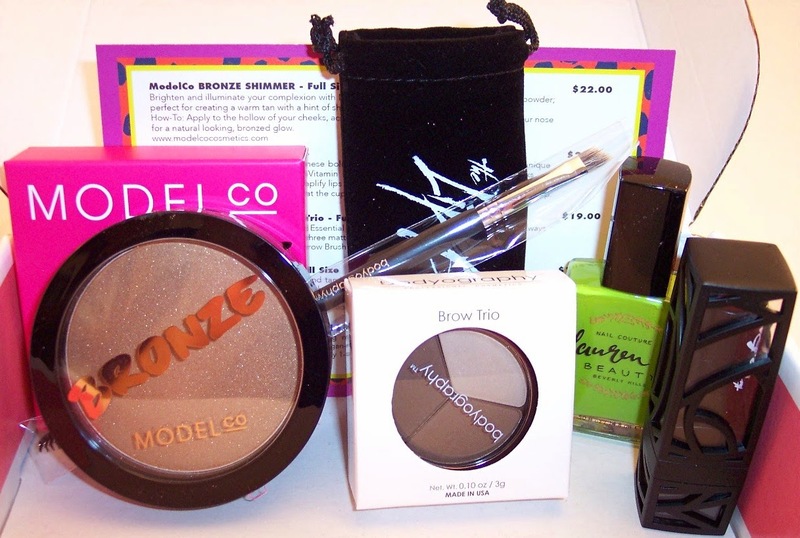 item in this box is the Bronze Shimmer from ModelCo. This is a BIG bronzer; I don't think I would ever hit pan on this one! 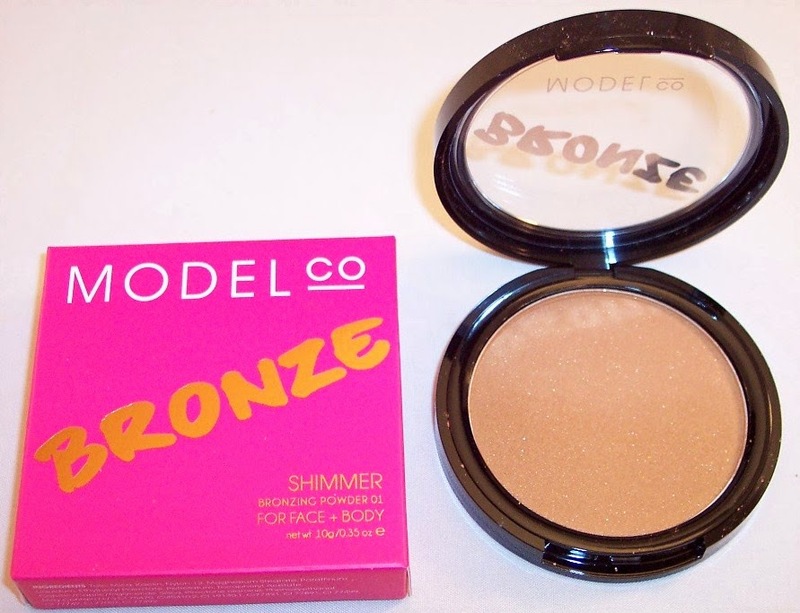 This bronzer has a bit of shimmer so I'm guessing it should be used sparingly. Contouring is another area of beauty science that is exploding right now; have you noticed the astonishing array of new bronzer products out there? ModelCo seems to be riding that wave. I've always enjoyed their blushes so have high hopes for this bronzer. What do you think? As always, I don't know how Boxycharm provides so much value for the price paid. All of these items are right on trend and the brands are ones I want to see in beauty boxes. I'm not usually quick to recommend annual subscriptions but Boxycharm has been around for a while now and has a track record of providing consistent quality in their boxes. At an average monthly price of $19.25 (on an annual plan), this is an outstanding value! If you're interested in trying Boxycharm, click here. Shipping is free and you can unsubscribe at any time. I have not seen many discount codes for Boxycharm, but as always, be sure to do your due diligence...Google for current discounts and check their Facebook page. By the way, if you're already a Boxycharm subscriber, they are in the midst of migrating to a new site. In the interim, the Charms rewards program is apparently down but they assure us that existing charms will be transferred to the new platform. Hopefully, we'll see some communication letting us know when that is done. 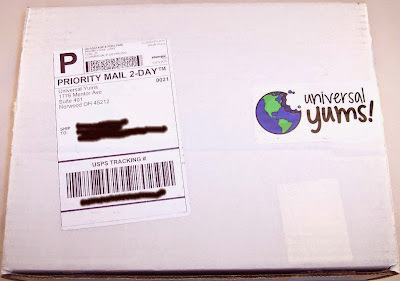 You'd think it would be hard to send a box of all new snacks to someone who has tried all the snack subscriptions but Universal Yums has managed to do just that. They have an interesting premise. 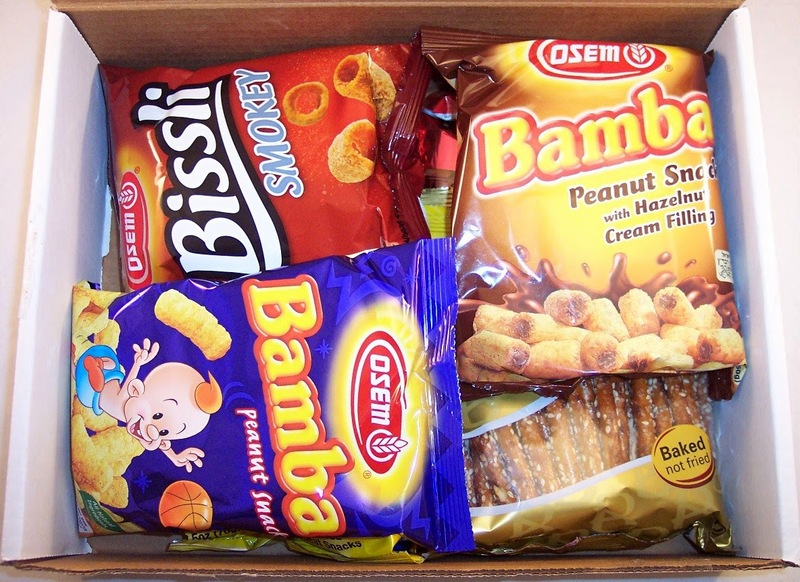 Each month's box is full of snacks and treats that represent a particular culture or country. The box contains a mix of salty, sweet, spicy and fruity flavors and contains only authentic snacks from the featured country. That tells me immediately that these people have some mad snack sourcing skills! So, here's a complete unboxing of my first Universal Yums box! It came in a large white box via USPS Priority mail with three logo stickers attached. 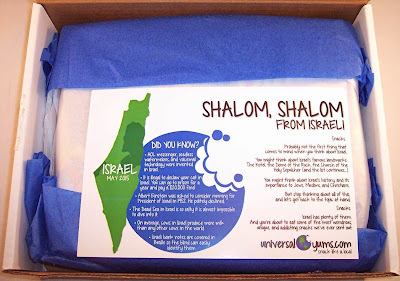 When I saw the blue and white tissue, I knew where we were headed, even before seeing the "Shalom, Shalom" card! 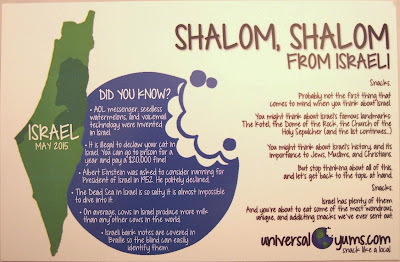 Off for some serious Israeli snackification! This is a terrible picture of the information card but it's actually the best one I've seen in a snack box. 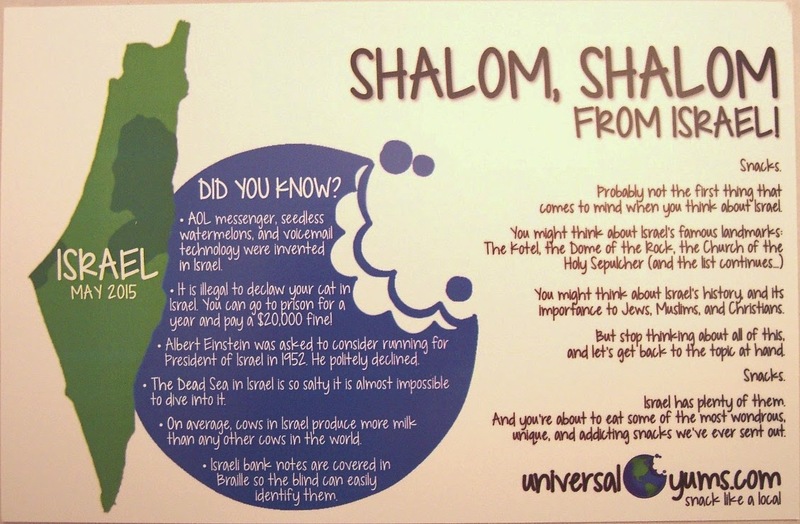 The front has lots of fun facts about Israel (Did you know that it's illegal to declaw your cat in Israel? That Albert Einstein was asked to consider running for President of Israel in 1952?) The back of the card gives a bit of information about each snack and a hint about the inspiration for next month's box. At first glance, it looks like there are mostly chip-type bags in this box. But appearances are deceiving. The card says that Osem's Original Bamba is Israel's most famous snack food. These look like peanut flavored Cheetos. 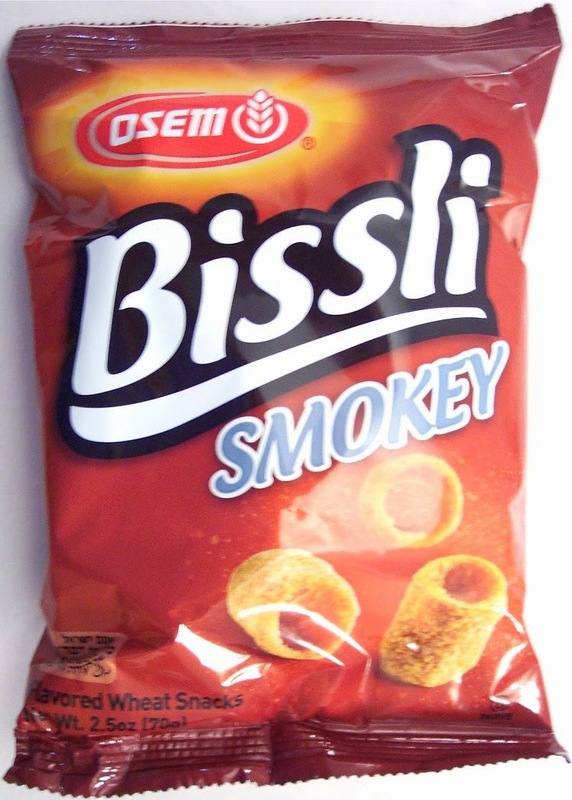 Next is Original Bissli from Osem which is a smokey wheat snack. These look like crunchy little tubes. 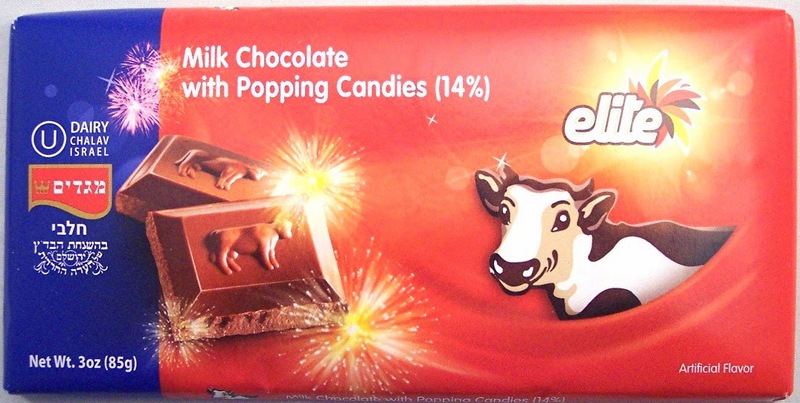 There is a big bar of Milk Chocolate with Popping Candies from Elite. I haven't tried this but I've noticed that popping candies (similar to Zotz from my childhood or Pop Rocks) are occasionally found embedded in foreign chocolates. They result in pleasant little explosions as you consume the candy. I think the cow is there to tell us this is milk chocolate. 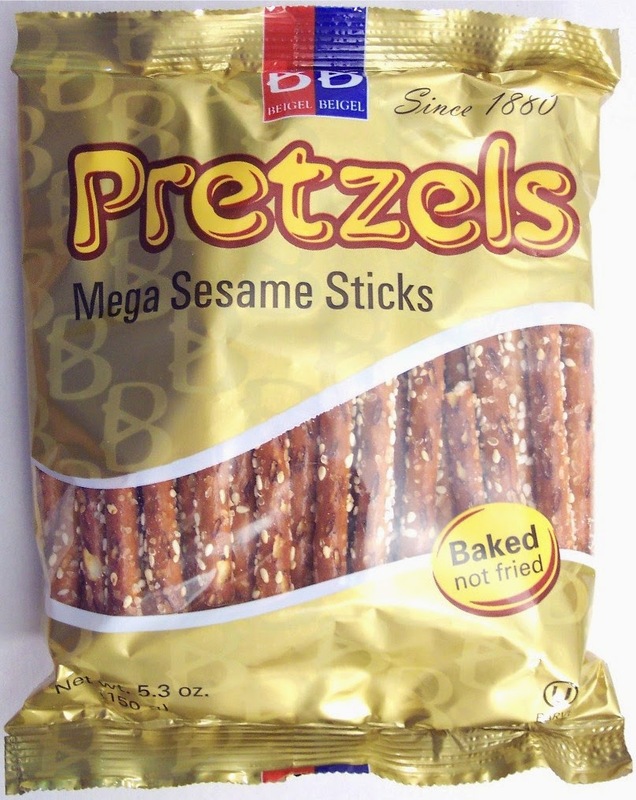 The biggest snack in the box is this bag of B&B Sesame Pretzel Sticks. I am not a fan of heavily salted pretzel sticks so the idea of sesame seeds (which I love) seems like a natural fit. These are also baked, rather than fried so they are reasonably o.k. nutrition-wise. And did I mention this is a HUGE amount for a snack bag! You tell me if this photo is upside down or not? I have no idea....just went with the photo which looks very much like a Kit Kat bar. It's called a Kif Kef Chocolate Bar so methinks it's a close cousin. 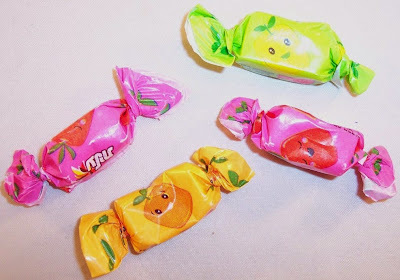 There is a small handful of toffee fruit chews in what looks like orange, lemon and strawberry. These are chewy and fruity, very tasty....and LONG GONE! This is a Pesek Zman Chocolate Bar; that name is Hebrew for "time out", a good description for any candy bar. This is a milk chocolate bar with a hazelnut cream filling. 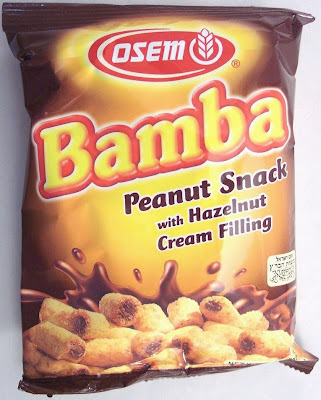 Here is another bag of Bamba from Osem, this time it's the same crispy looking peanut snack but with a hazelnut cream filling. This country sure loves its Bamba! This bag contains a snack from Osem called Bissli Falafel. These are crunchy flavored wheat snacks. 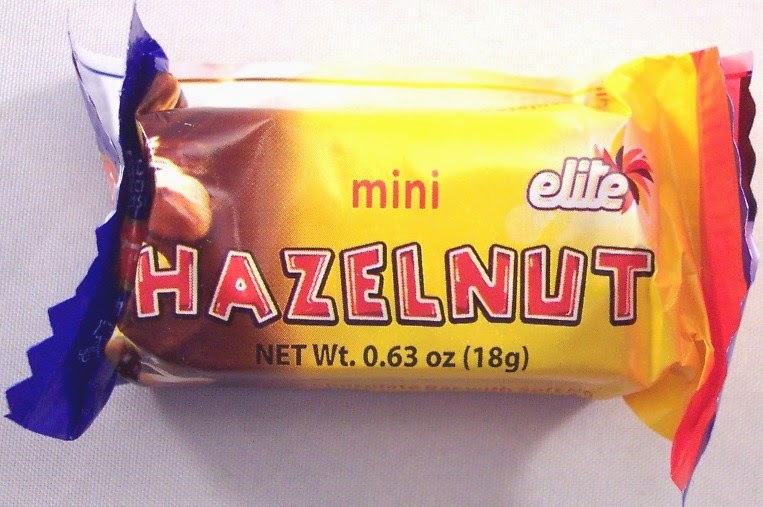 This is a Mini Hazelnut Chocolate Bar from Elite which is described as similar to a Snickers bar with hazelnuts instead of peanuts. Last but certainly not least is a Marble Sesame Halva bar. Halva is made mostly from sesame seeds and butter and is popular in the Middle East because it requires no refrigeration and can withstand high temperatures. This feels like a pretty substantial and hefty snack. I was very impressed with this box! Lots of snack subscriptions include international snacks but this is the only one I know that focuses on one country at a time, giving you the chance to "dive deep" into local snack habits. You may be aware that another company tried this concept but failed last year. My theory is that they went under mostly because they didn't provide any information about their snacks and there was no theme to their boxes. Since the majority of foreign snacks are not labeled in English, subscribers were pretty much in the dark about what they were receiving. Also, the quality just did not compare with my first Universal Yums box. Some of the regions and countries recently featured in Universal Yums boxes are Scandinavia, China, Italy, Brazil and Germany. If you'd like to see what was included in those boxes, click here. Boxes are shipped between the 8th and 15th of each month. If you sign up before the 7th, you'll get your first box the same month. If you sign up after the 7th, you'll get it the next month. Ready for more Yums in your mouth? Start thinking of a place down in the south. If you're not into chiles, mangos or limes that's okay. These Yums will still make you say "ole!" Well, it must be Mexico or somewhere in South America. 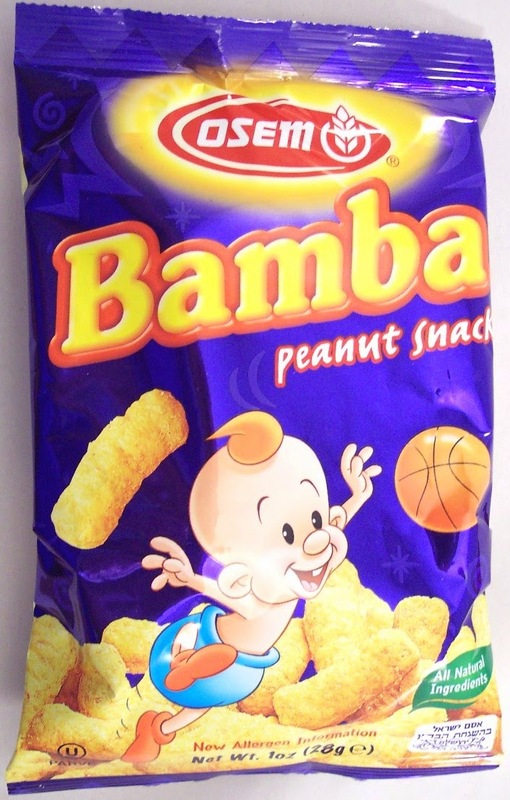 I can't wait to find out where this global snack adventure lands us next!